Cosmetology programs are a great place to develop your artistic talent and learn the skills and techniques you’ll need to have a rewarding career in the beauty industry. 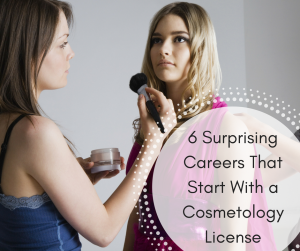 There are so many career paths available to you if you have a cosmetology license, and not necessarily just in salons and spas. This is the most well-known and popular career choice in the cosmetology industry. Hairstylists have passion and skill for creating and maintaining hairstyles for clients, including cutting, styling, and hair color services. If you have a passion for pedicures, you can have a rewarding career as a nail technician. Nail technicians provide manicures, pedicures, and synthetic nail services. Estheticians are all about skin care, including facials, waxing, spa services, and more. They help beautify and maintain the health of their clients’ skin. Did you love middle school makeovers? Makeup artists transform clients with skilled makeup techniques. Having a cosmetology license will set you apart from many freelance makeup artists, making you more appealing to established makeup brands. Beyond the Salon: What Else Can You Do as a Licensed Cosmetologist? Work behind-the-scenes in fashion as a stylist. People look to runway shows for their fashion, hair, and makeup inspiration, and you’ll make connections with fashion experts worldwide. Get models camera-ready for editorial and commercial photo shoots. This is a fun career for stylists who can execute a wide variety of hair and makeup looks — from the girl-next-door to high-fashion. Picture your favorite celebrity. Now picture yourself being the person responsible for doing their hair and makeup! Everyone from actors, musicians, to even local news anchors use personal stylists to help them look their best before going on camera. Before lights, camera, action, there’s lights, hair, and makeup. Film and theater stylists are responsible for transforming actors into their characters, so they possess a wide variety of skills and techniques to alter someone’s appearance. If you live on the cutting edge of fashion, you might consider becoming an artistic director for a brand or salon. Artistic directors lead the charge on the creative direction, imagery, and concept of a beauty brand or company. They’re pros at predicting upcoming trends, and can both execute and teach new looks to staff and the general public. Is all the world a stage for you? Platform artists are a mix of master stylists, teachers, and live entertainers. They travel and perform onstage at hair shows, beauty shows, and other beauty industry events, showcasing techniques, products, and collections on live models. If you have determination, talent, and passion, the skills you learn in your cosmetology program will open a number of doors in the health and beauty industry. If you’re ready to pursue your cosmetology license, contact one of the Academic Advisors at Health and Style Institute today.